For those who don’t want to read a long and winding writing, the short one is for you while the long one that follows comprises reasons and some of my observation/opinion on coffee in Bangkok based on cafés I visited during the trip. This café trip in Bangkok gave rise to experiences I haven’t had before in Hong Kong. Apart from the cup quality, the thing that surprises me the most is the attitude of coffee people in Bangkok. I agree with one of coffee professional I talked to that the level of professionalism and receptiveness to criticism are important factors that hold back the quality of coffee in Bangkok; it’s not the machine and not the green that people previously believe or like to believe. The extent of the problems with various drinks at Thai cafés is quite severe, IMHO, to the point that quite a few are too difficult to drink and more of a sink-worthy kinda thing. The number of problems alone via the chart didn’t tell the whole story. The severity of the problems is more toward drip coffee. I had problems with drip ranging from practically no taste of coffee in the cup ie a brown liquid, way too light taste, no middle tone i.e. a hole/gap in the middle of each sip, dryness to atrociously way way way too tight drip coffee. Most of these barista sipped the coffee before serving them to me so I have to wonder whether those barista know how drip coffee should taste like. Having no better way for suggestion, I resort to recommend them to go drink more coffee outside at cafés that serve good drip in Bangkok that I know of. However, these barista didn’t take it well. On espresso based drink, you will get a tip top “milk pattern” at all the places I visited, probably the proliferation of lots of latte art schools in Thailand. They know how to do latte art well but it is as if the latte art becomes a de facto standard for the cup quality. The major issue with milk drink in Bangkok is sour and practically unsweetened yogurt like milk drink which seems to be ubiquitous there. For espresso, I had more issue with salty, super tight drink than anything else, so tight that I would rather throw it all in the sink. This super tight espresso reminded me of espresso in Hong Kong back in its early days in 2009-2010 when all espresso were tight and some advanced cafés here called these cups “local HK style espresso” in a derogatory way. But the tightness of Hong Kong espresso in that era was nothing or at best just a child play comparing to espresso served to me in Bangkok during this trip. With all the scathing words on coffee I had on coffee in Bangkok, let see how they compare to cafes in Hong Kong. A more ‘economical’ way to compare is to pick the café I am more familiar in both places which are mostly in the top notch cafés. The top 5 HK cafés I benchmark this time are the Cupping Room, Freshness Coffee by Michael KT Wong, Jonathan Fan A Side/B Side, Sara Chung at N.O.T Specialty Coffee and Kenneth Lam at Cucus. You can see how different the score is; the difference is 1.5 star i.e. BKK gets 3.4 stars and HK is 4.9 stars out of five stars. To me, the difference is very significant and you can’t expect the same level of quality like what you typically have in Hong Kong if you visited Bangkok for coffee, at least not now. Initially, coffee people I talked to said that it’s because the kind of green Thailand mostly grows is Catimor varietal. Slapping a 90% import tariff on imported green beans, the saying goes that most café in Thailand has no choice but to heavily rely on local green coffee due to cost. Still, Catimor or green quality are not really the main issue now from what I experience in Bangkok. The major problem is its coffee people and their abilities to accept criticism, be it constructive or not, IMHO. The deletion of my writing shouldn’t come as a surprise years back when Thai societies are less opened then. Whether the request for the deletion from the shop operators is reasonable, you can be the judge on those writing yourself. In addition, before those writings got pulled down, lots told me about some ‘noise’ regarding my writing on those cafes in “very angry” manners from coffee people. From what I gather in the public, those who are willing to show their discontent is north of 50. Drawing from those noises, if we were to include disgruntled but silent coffee people, the number could easily be two to three times, ie 200 people at least. I doubt whether we can call this much ‘minority.’ As such, in general, please be very careful on your comment, no matter how nice you think they are and how beneficial you think it will be for that café for the sake of your safety. Notice that two cafés in this group are quite new to the business including Pacamara X Specialty Lab (2 week of opening when I was there) and Ekkamai Macchiato (2 months). For these two cafes, I would like you guy to give them more chance as it took some time for new operations to settle down and I have a high hope on Pacamara X Specialty Lab to serve not just good but great coffee as I’m impressed with the knowledge and an insatiable appetite to learn of its owner. Six months into its operations, i.e. by this February, I hope this cafe will soar. For Roots, the tall bar of Roots was coffee from the owner; otherwise, the short blue bar applies for its regular barista. Ekkamai Macchiato has good ambience and decent banana cake while its coffee still needs quite a few fine tuning for the prime time. Two major reasons I visit this café are 1) the cafe is on 7 Good Cafes In Sukhumvit, Bangkok: The Sprudge Coffee Guide, and 2) another chance to try drip coffee roasted by Bottomless Coffee Roaster outside its own shop. At the time of my visit, the shop is about two months into its operation. Typically, I will allow at least six months for the shop to settle in before I make a visit. However, I happen to be in the area so I have no choice but to visit as is. The interior decor is great and comfortable to sit. The shop is also quite quiet too even it’s raining cats and dogs outside on the day I visit. Well thought out indeed. The shop sports Linea Classic and three grinders which should allow barista to make magic out of any coffee as their skill allow. My cappuccino of its house blend from Bottomless Coffee Roaster came out rather tight and sour which seems to be typical for milk drink in Bangkok during this trip. Another attribute for Bangkok’s milk coffee is good to great latte art which you can also find it here. The frothed milk itself could be good but it is imperceptible with the sour milk drink like this either from the espresso base or from too little milk use in the cup. I actually look forward to try drip of roasted coffee by Bottomless Coffee Roaster at this place; however, they ran out of drip coffee from this roaster. The only reasonable choice left here is coffee roasted by Ink & Lion, a new roaster in the area. The drip brew of this Colombia Hacienda Supracafe is rather disappointed. The cup was way too tight with an overextracted tone thrown in there. I haven’t had this kind of coffee way too long; it reminds me of a pour over workshop coffee enthusiasts brewed for us all to taste. All the tasting notes ie toffee, chocolate and stonefruit seem to be there but the cup is way way too tight for coffee drinkers to really appreciate anything meaningful on this coffee. What great about this shop at the time I visit is its banana cake. It has quite a nice texture and is not those softer than soft type which is good. In addition, the cake has lots of banana chunk in there too. In fact, this type of cake or some acidic cake like lemon or orange pound cakes will go well with the type of drip coffee serves here at the time. This acidic cake will help spruce up the acidity and the sweetness calls for something strong to cut it down, a good thing while the brew skill of its barista settles in. This should be a combo that the shop puts a heavy emphasis on at this point in time with this level of brew skill. Mind you the shop just opened two month on that visit. By the time this article is post, all these kinks should be fully ironed out as it will be six months after the operation if this shop wants to become a place for coffee lovers. Hopefully the reader won’t experience what I went through at the time. If the owner is the barista for you on the day you visit, you are in luck. If all else fails, there are quite a few good cafe in the area for you to explore. I have been following Roots for quite some time since its inception as Roast years back and was impressed with its Journey Espresso Blend at the time. This Journey Espresso blend scored high at 92 points on a website called coffeereview , an achievement for this new roaster back then. Thus, I have a high expectation for this café on this visit. The directory at the elevator didn’t tell me where Roots is. So I went up to its next of kin, Roast, which focuses more on its food operation, just in case. I was told by Roast's staff that Roots is at its ground floor called “Market,” mixing among various food shops down there. I found no sign of Roots during this visit outside Roots’ premise and this can be easily rectified if the management wants to do something about it. The coffee shop was so busy as expected as this is Sunday afternoon. In addition, with location and building complex likes this, a busy café should be a given. Luckily, there is one counter seat left for me. Roots has its coffee accessories operation called The Yellow Stuff and its merchandise is quite prominent here on the right hand side of my counter seat. I don’t have enough space for my bag for this trip so next time then. Typically, you can expect any Thai café to be big on iced drink as they claim the weather down there is hot. Roots’ take on this Thai favorite is in the form of cold brew, I believe. Pictures of elaborate decoration of Roots’ iced coffee drink adorn Root’s various social media channels, be it Instagram, Facebook, etc., and be it cold brew coffee with herb, fruits, sometimes colorful ice, syrup or the combination of them all on top of the cold brew in the plastic cup. It was quite closed in nature to signature drinks in the barista competition. However, I didn’t see any customer ordering this ‘fancy’ drink during my visit. A “purist” on iced coffee, if there is such a thing, may be better satisfied with its straight cold brew coffee. This poster seems to hit the nail on the head of cold brew “aficionado” on how serious Roots is on its cold brew. Gesha coffee in cold brew anyone? I am not into cold brew both the straight or ‘fancy’ versions that Roots seem to excel or boast, at least from its pictures, on the back of what I perceived as a fermented alcoholic taste in any cold brew I had in the past, so I pass. But if you are a cold brew fan, seeing such pushes on the beverage should beg you for a try. The menu here is closer to all the hipster third wave café with traces of “the old world”. Gone were names that are associated with traditional beverages we are familiar with ie espresso with milk replaces Cappuccino, Latte, etc. The menu is similar to NYLON Coffee Roasters in Singapore and reminds me of Prufrock Coffee in London, the place that I believe come out with this ‘stripped down’ menu to ‘undo’ the complication of various traditional coffee drink. Of note is its Iced Americano. While espresso with water stands in for Americano, there is iced Americano on the menu! Why not iced espresso with water? The water here has no fruit or things in there which is a good thing. Such additive was meant to help freshen up customers but, to me, it interferes with the taste of good coffee. This is a good thing, IMHO, as I don’t need to bring my own bottled water there to appreciate the coffee. What I get is a thin, acidic and a bit too long pull for this coffee in the cup and I can’t say that it is delicious. My understanding is that this is an attempt to show off all the flavor in this coffee as much as the coffee could or so it seems. The long pull reminds me of what the Cupping Room in Hong Kong did a long while back after the EK43 grinder just became famous and the Cupping Room team just returned from its Australian trip. Luckily, this style of espresso was quickly abandoned at the Cupping Room. To me, the pull style yields too thin a cup with not enough character to the coffee ie pushing the coffee way pass its limit. In addition, this cup, to me, tastes much closer to a very concentrated drip that gives me an empty feeling on the body and didn’t seem to bode well with the coffee used on that day. I can only wonder how this exact coffee tastes like in drip. Next stop, Roots' drip coffee offering. The presentation by another barista is great with Acaia scale and stopwatch, a showstopper to any customer who has the privilege to sit at the counter and watch the barista’s move. However, the cup is a total disappointment. To me, the cup doesn’t have enough coffee taste in it, i.e. more like what I called tasteless brown liquid than anything else. It is as if the extraction has totally gone awry even though he seems to do the right things in front of me but the coffee in the cup doesn’t lie. This cup is among a few of uninteresting cups of coffee that I tried in café since I became interested in drinking coffee. In addition, whatever tasting notes that are left in the cup are really pale in comparison to coffee from Colombia these days to the point that I wonder where one can get Colombia like this in the age of much improved Colombian coffee that we are in these days. The disappointment I had with the first two cups of coffee for this first cafe on my Bangkok coffee trip reminds me of quite a few coffee enthusiasts that I drank coffee with who has a chance to visit Bangkok. When asking about the coffee at Roots, they gave me no comment at all. It is a red flag! Luckily I ran into Khun Tae (pictured above) who is the owner of the shop and represented Thailand at WBC 2014 in Italy as I was later told that it is quite difficult to find him in his shop. I expect the guy who represents the nation on any coffee competition to know a thing or two about good coffee. Because of this, even with two prior successive failures on coffee from two barista at this cafe, I bite the bullet and order my third cup of coffee. Let just try the house blend espresso and I specify and make sure it’s Khun Tae the owner who will pull my coffee for me. Boy oh boy, had I not ordered this cup, even this is my third cup of coffee for this café, I would have missed why Roots is so famous for its coffee. The house blend of Brazil pulped natural and Colombia natural pulled by the owner Khun Tae yields a delicious cup of espresso, rivaling what I had regularly at the Cupping Room in Hong Kong. It has a nice, thick and silky body with clear acidity. This is followed by a clean aftertaste so good that you can easily sense the floral note that tell you there is quite a few natural coffee in the blend even if you don’t know what coffee they use. The good pull like this makes me appreciate the coffee so much so I wonder how it is like if each coffee in the blend is presented as single origin espresso. This is one of outstanding cups I haven’t had for quite some time. The main issue with Roots is a totally different experience each barista delivers to you. While this sounds like a given, the gap between each barista here is tremendous, probably the widest among café I have ever visited until now to the point that it is a no go/avoid for Roots on one barista and it is a must visit for Roots for another barista. And the issue is much more severe on drip coffee than espresso; still this issue on drip coffee is more or less the problem with most café I visited during this Bangkok trip but whether this is a good excuse is arguable. I blame this on Roots' training program and its management that lets this kind of coffee slip through to its customers. Again, it shouldn’t be too much redundancy to stress that such quality gap is a single major concern for any coffee drinker at Roots. It’s that significant and worth repeating. Despite the inconsistency among barista, I still recommend Roots to coffee lovers. The superb cup I had from the owner worth the huge risk coffee lovers need to take in visiting this café. If you didn’t see Khun Tae the owner working behind the counter and brew your coffee, at least you can enjoy the space that houses Roots which is rather hip. If all else fails, there are quite a few good cafés in that neighborhood to satisfy your quest for good coffee in Bangkok. In addition to the distance from the hot bed of Indy cafe these days in Thonglor/Ekkamai area and in spite of the good intention of the operators, the coffee at Bottomless remains to be improved. I met the owner of this shop years back in Hong Kong during the HK café tour by Thai coffee owners and have been looking forward to visit the guy at his own shop since then. Mind you that this shop is quite far out vs. other cafés so you can’t just swing by but really need to go there for the coffee. You’ll see dark tinted film on the window almost everywhere, not just only car, in Bangkok so this is quite typical in Thailand. The claim to fame is that it helps cool down the shop. Once you are in the shop, you understand why. 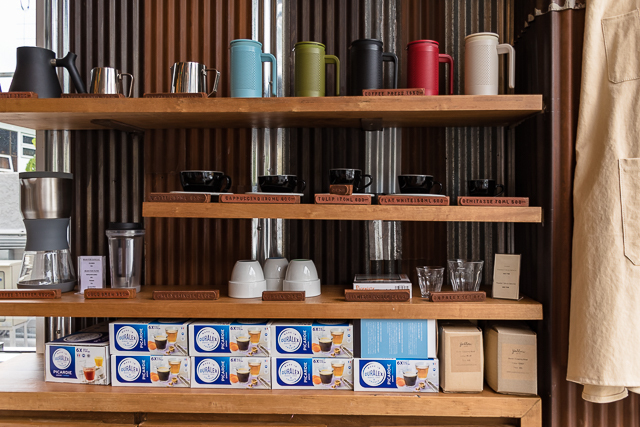 Its shelf are well stocked with coffee accessories; there are only two coffee bags on the shelf. This implies you need to ask if you want to buy coffee roasted by Bottomless Coffee Roaster itself as they are not shown here like other roaster/cafe operations. For its workhorse, the shop is fully loaded with the $$$ Kees van der Westen’s Spirit, accompanied by three espresso grinders. Starting with my usual Cappuccino of AEC blend (aptly named from ASEAN Economic Community? ), comprising Thai, Lao and Sumatra beans. What good about this cup is the nice latte art and free pour of the milk which helped retain some texture of the frothed milk. Nevertheless, I wish the milk texture is much more velvety than this. Overall, the cup was quite tight with dark caramel tone and a hint of saltiness which is not quite comfortable to drink. The style of the coffee is quite unique, neither an old world charm nor a third wave brighter cup of coffee, somewhat of a hybrid that I can’t quite put my finger on what type of coffee the cafe wants this blend to be. Considering the component in the blend with big bodies from Sumatra and some base coffee from Thai and Lao, the tone of the cup should not be unexpected. Still, I expect a more succinct character/style from this cup than it is served to me. Next stop, espresso. The espresso is served with some nice candy though I didn’t have a chance to have them as I want to try more coffee here. The espresso is pulled the owner himself and the shot isn’t too bad. Still, the espresso is quite tight for my liking and I didn't get the hint of fruit at all vs what was said about the blend. This type of tight shot reminds me of “HK style” espresso at least more than five years ago. While those tight shots of yesteryears espresso in Hong Kong was routinely ridiculed and scorned by quite a few Hong Kong third wavers at the time, those espresso still managed to deliver some sweetness to drinkers, partly its selling point. This espresso at Bottomless, however, is tight and on a salty side. The barista suggests me Guatemala for siphon and this is the only reasonable choice for me among all of its coffee line up on that day as I prefer Central American coffee. But before the coffee, it is of note for his moves on siphon. This is the first time I see a barista using the bamboo paddle to press the paper filter while the water rises up. Interesting. Another first for me is the serving vessel. This is the first time I was served drip coffee in stainless steel container. Some barista told me that they won’t do this as it may impart some metallic taste to the coffee. But as long as the coffee is good, who care? On the coffee, this Guatemala is filled with smoky tone like any other Guatemala so, again, it is not unexpected. The coffee also has a hint of tobacco and is almost on a savory side than sweet. I couldn’t get any other tasting note clearly. Suffice to say that siphon is supposed to be the brew method that delivers a more analytical cup of coffee with clear tasting notes as much as that coffee can deliver. This cup is not all that. At that point, I’m pretty much exhausted and despaired with all the coffee I had so far. Luckily, I was suggested by the owner to try a drip of Cup of Excellence coffee from Colombia. The same barista that does the siphon drips the coffee for me. To my shock and horror, I get a muted and relatively tasteless cup of coffee as if you got cheated that the green used isn’t COE but something else. There is no way that the $$$ COE coffee will taste so muted like this. I am so curious and ask for a bean to chew. OMG, this way, the coffee is heavenly delicious and worth its rank from COE. Layers of fruit and sweetness are bursting to the seam in my mouth. This shows that the coffee and the roast work are all quite okay and my taste bud on that day is not busted after all. I can only wonder how impressive this coffee will be even with simple brewing method used in coffee cupping. Also, to me, it takes a lot to brew this coffee to result in such a tasteless cup like this. In all, the coffee bean and the roast work at Bottomless are reasonable with a certain style. Give it a chance any time you see its bag out there. While the location doesn’t bode well for café crawl as Bottomless is quite far off vs. Bangkok coffee hotspots of Thonglor and Ekkamai in the Sukhumvit vicinity, a more urgent issue that needs be addressed here is not its location but the barista and his brew skill to match the coffee on offering.